Aeromotives products are rated for precise fuel delivery up to 1000 Horsepower: big performance in a small package! Superb pressure control and legendary durability is what Aeromotive is known for.The Aeromotive Compact EFI Regulator is designed for applications producing up to 1,000 HP and works great even where space is at a premium. It has the standard vacuum/boost reference port for rock solid 1:1 increase in fuel pressure. Ideal for return style EFI fuel delivery systems which are limited to one regulator inlet port. This AFPR has a range of 30-70 PSI with the inlet and outlet both using #6 A/N Fittings. On the street and at the track, these pressure regulators have logged more miles, more laps and more passes than any other brand EFI regulators in the world. 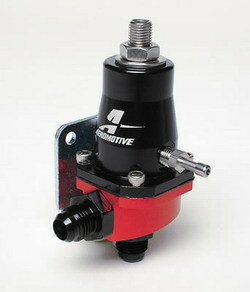 Use this Adjustable FPR to help trim or increase flow from your injectors. Ideal for dialing in exactly the amount of fuel you will need from your heavily tuned engine. Requires A/N terminated fuel lines to be installed.